I completed all my plans for three back-to-back greater Chicago area antique shows in April, which included non-refundable airline, hotel and car reservations. Serendipitously, I found out that the first show, the Arlington Park Racetrack Antiques Show, had been cancelled. I really don’t know what I would have done if I had shown up to Arlington Racetrack and found out there was no show. Mixed emotions — sorry the show was cancelled, but relieved I had enough time to change my plans. 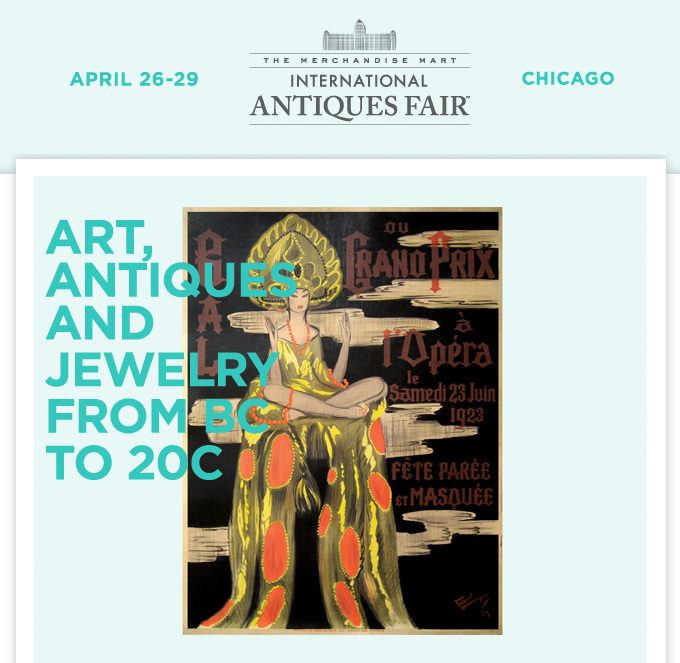 Next, I found out that the long-time director of the Chicago Merchandise Mart Antiques Show, Laurette Lutiger, left the Mart to work for another show promoter, the Palm Beach Show Group, promoters of the Palm Beach Jewelry, Art & Antique Show and the Baltimore Summer Antiques Show. I wish her the best of luck in her new job. 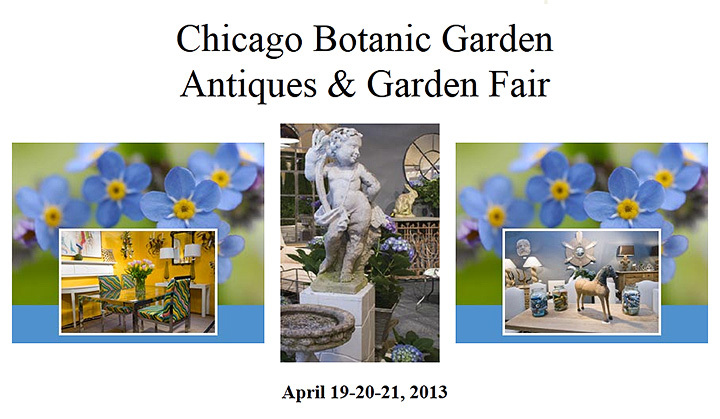 So now our show schedule in Chicago begins with the Chicago Antiques & Garden Fair at the Chicago Botanic Garden, 1000 Lake Cook Road, Glencoe, IL. It will be our first time there. Hopefully the show will be good for us, so we can make it a regular show on our schedule. We have many clients in the greater Chicago area, so if a show fails, we need a replacement. We’re bringing an impressive group of items that will be shown for the first time in Chicago, including Tiffany lamps and glass and French cameo glass by Gallé and Daum. Please visit us at the show. It opens to the public on Friday, April 19th, at 10 AM, and continues until Sunday, April 21st, at 5 PM. Click here for more information about the show. I recently listed over 15 new items, including several Tiffany lamps and vases, as well as two fine Grueby vases. Click here to view the Tiffany lamps for sale. We always strive to offer the finest objects for sale on our website and at every show. 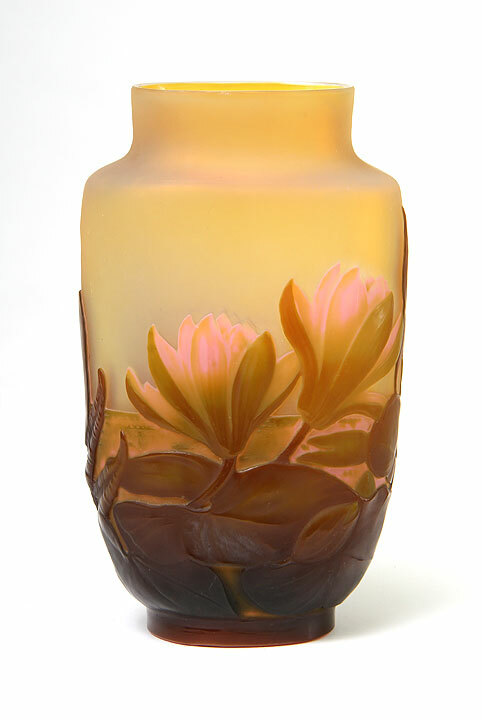 James D. Julia, Inc. held an important Annual Winter Antique, Asian & Fine Art Auction with excellent results. Over 1800 lots crossed the block from January 30 – February 1, 2013, grossing over $4 million. It wasn’t unexpected that the highlight of the sale was an Asian object, as the market has been hot for some time now. What was surprising was that the object was Korean, not Chinese. Lot #3355 was a Korean 10-panel screen depicting animals and trees, with an inscription on the back that read “Ten Panels for Long Life”. Julia’s experts didn’t realize the importance of the screen, as it went to the auction block with a pre-sale estimate of only $3,000 – $5,000. To the delight of the consignor and the auction house, it soared to $603,750, including buyer’s premium — a hit-the-jackpot moment. Over 400 paintings were sold on the first day, with lot #1010, selling for the highest price. 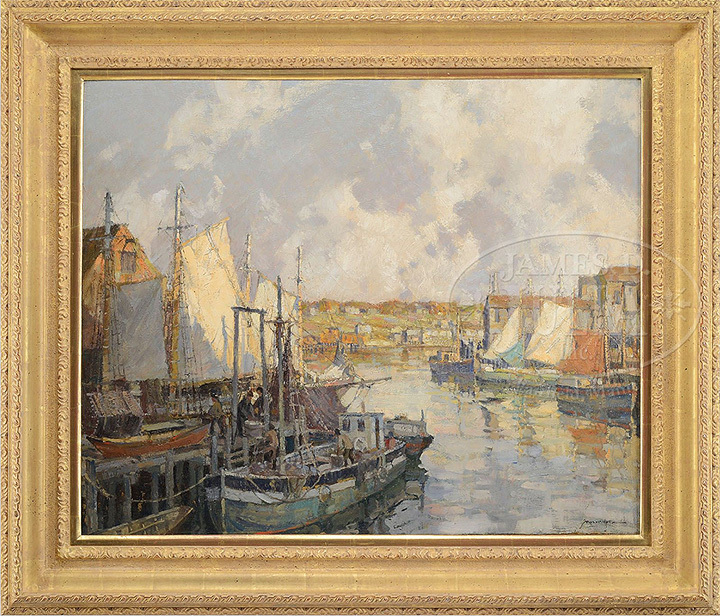 Against a pre-sale estimate of $50,000 – $80,000, a Frederick Mulhaupt painting entitled Gloucester Gill Netters, sold at the low estimate. It was one of several Mulhaupt paintings consigned from the collection of John Gale. For the highlights of the sale, click here. 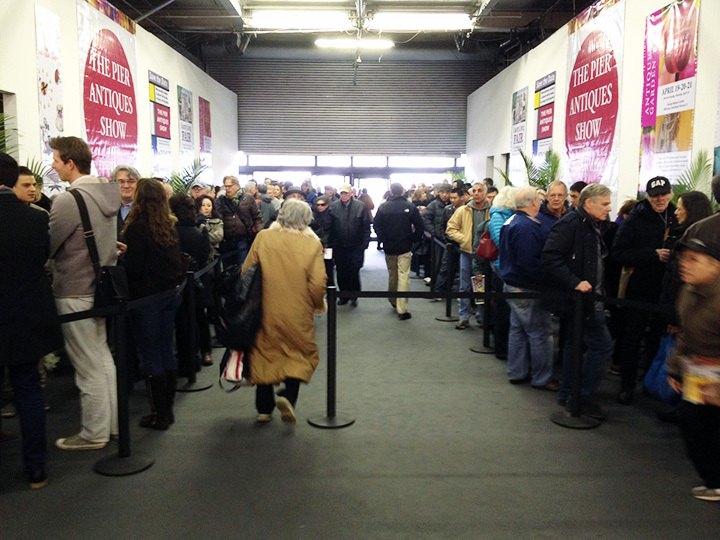 The NYC Pier Antique Show ended yesterday, March 17, 2013, after running for the weekend. Attendance was noticeably lighter than in November, at least partially due to the St. Patrick’s Day parade on Saturday and a mini-marathon on Sunday morning. Parking was limited and difficult. One client told me he circled around for an hour before he could find a garage. Personally, my show went poorly. Many of my good clients either didn’t attend or didn’t buy much or anything. Sometimes you’re the dog and sometimes you’re the hydrant. In asking around to more than a handful of dealers, the best I heard was “almost as good as November’s Pier”. Most of the responses were “fair” to “decent” to “OK”. No one I spoke to was enthusiastic about his or her results. It’s hard to predict. My last several shows at the Pier were good to excellent. This comes after a wonderful show in Miami Beach, to which one dealer told me “we’re not in Miami anymore”. Now about the rumors wildly circulating on the show floor. It appears that the Pier Show will probably be sold to US Antique Shows, the promoters of the Original Miami Beach Antique Show. They recently purchased the Miami National Antiques Show and Sale and appear to be shopping for other good shows. My guess is that it’s a done deal and the official announcement will come soon. There’s other important show news from elsewhere in the country that I’ll let you know as soon as it’s official. Now we’re looking forward to our shows in April in Chicago, one of our favorite cities. Business in Chicago is consistently good. We have very loyal clients there, many of whom are now personal friends. 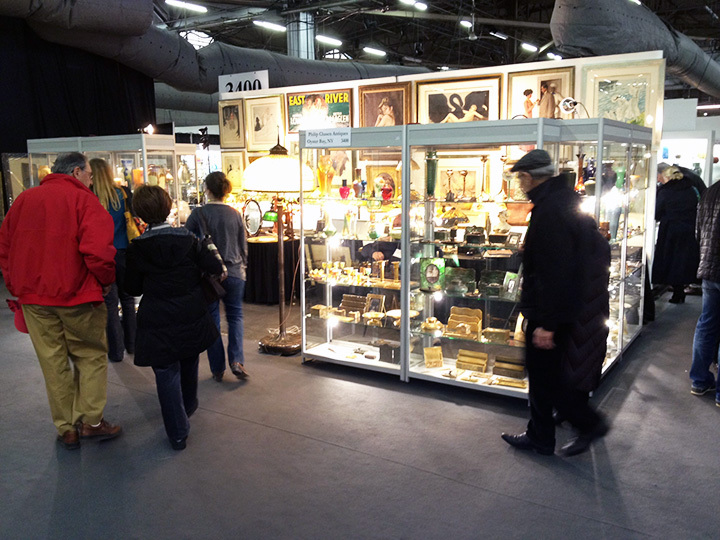 The fantastic NYC Pier Antiques Show opens to the public this coming Saturday, March 16th, at 10 AM and continues until Sunday, March 17th, at 6 PM. This is an exciting show, with an incredibly diverse group of dealers. There will be $25 items, as well as $100,000 items, from vintage clothing, jewelry, collectibles, silver, Asian, and of course, the best French and American art glass and lamps. The show is only two days long, so it’s more action-packed than most longer shows. People have to make up their minds quickly or risk losing the items they were considering. I’m always surprised (and pleased) with the distance attendees travel to visit the show. Japanese buyers attend regularly, as well as Europeans, Canadians, and of course, Americans from many states. Not many shows are worth the trip from almost anywhere, but this one is. My booth is near the entrance, so you can’t miss me. Please stop in and introduce yourself. I’m bringing an incredible selection of fresh merchandise, including wonderful French cameo glass, Tiffany glass and lamps and much more. You will enjoy the show, so make your plans, even if they’re last minute. Come early and stay late, because the Big Apple is a great playground! Tune in Monday for the results of the show! 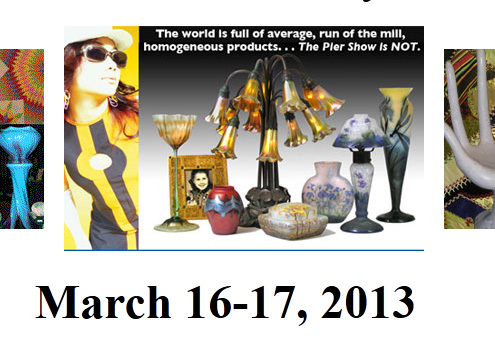 David Rago held a very successful 20th/21st Century Design Auction on March 2, 2013. The sale grossed $5.25 million, exceeding the high estimate, with a sell-through rate of 85%. 308 phone bidders competed with the live audience and 1500 Internet bidders. Absentee bids totaled over $3 million. 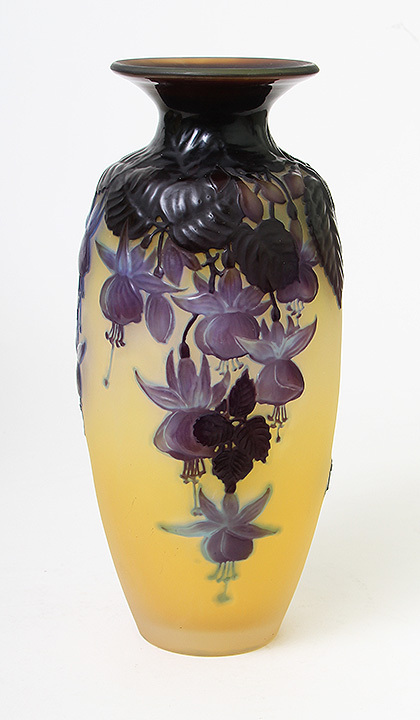 The 20th Century section of the sale was led by a rare, monumental (22½”), Teco vase with iris flowers. Estimated to sell for $35,000 – $45,000, it blew past the estimate to sell for an astounding $212,500. The results for the sale of seven Martin Brothers birds confirmed the strength of the market, which has been hot for decades. 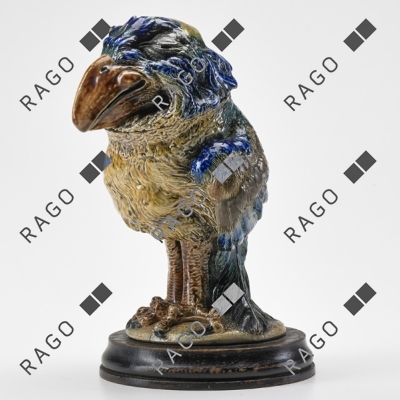 The group was led by lot #150, a large bird with a bald head, at one time in the famous Harriman & Judd collection. It more than doubled its low estimate of $35,000, to sell for $93,750, including buyer’s premium. The average selling price for the seven birds was an impressive $44,643. 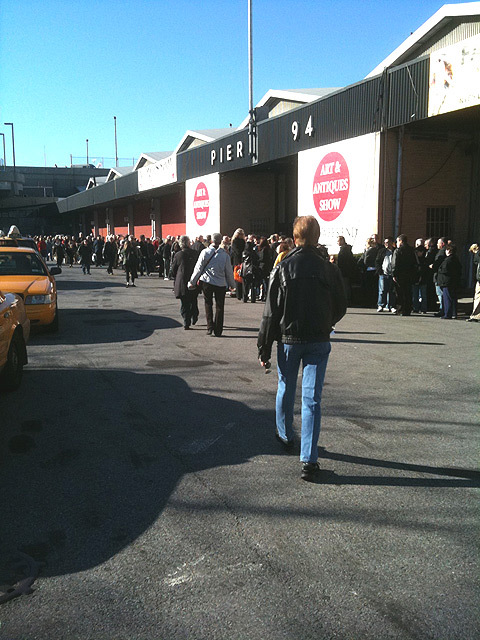 Remember the fantastic NYC Pier Antiques Show opens to the public this coming Saturday, March 16th, at 10 AM. Make sure you attend this exciting show. Sotheby’s held a 20th Century Design sale on March 6, 2013, with very good results for Tiffany Studios lamps, glass and desk sets. The sale totaled over $3.6 million, led by a strange Ron Arad experimental “Rietveld Chair” from 1996, which sold for $194,500. Since I don’t know understand why, I’ll stick to a subject I do know about, namely Tiffany Studios. 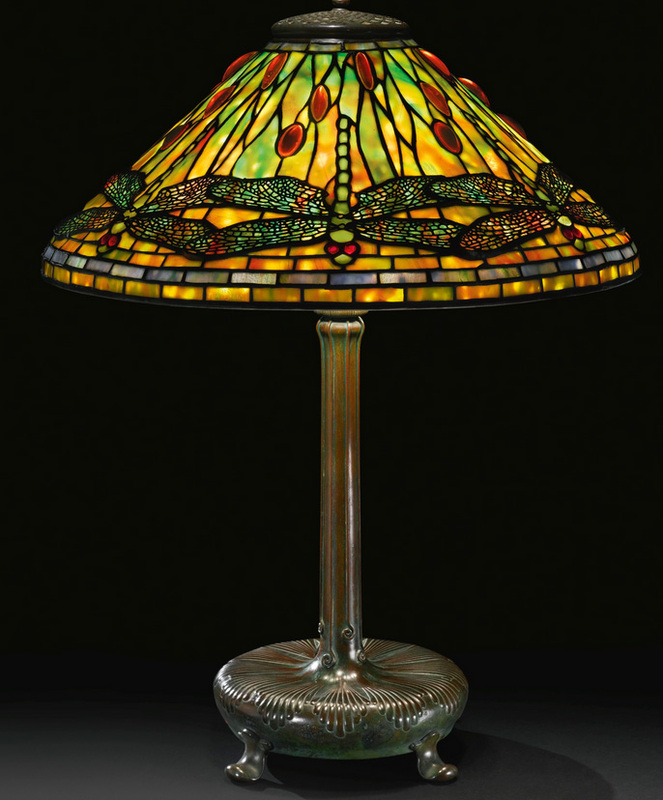 Top lot of the Tiffany Studios section of the sale went to #28, a fine 20″ diameter Dragonfly table lamp, with red jeweled eyes and beautiful wings, in excellent condition. Estimated to sell for $50,000 – $70,000, it realized $98,500, including buyer’s premium. I had a lovely spot in my home for the lamp, but it wasn’t meant to be. 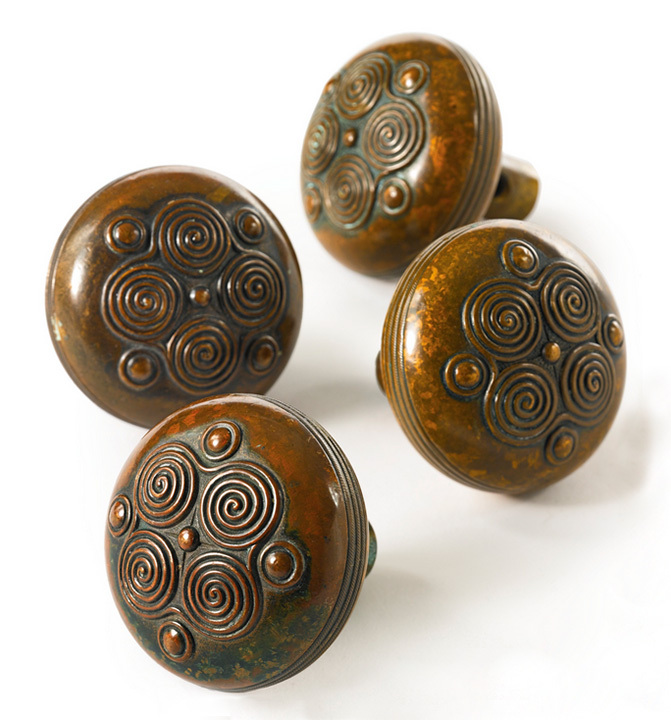 It’s not every day one gets to bid on a rare and unusual item, like a set of four original Tiffany Studios door knobs. I can count on one hand the number of times I’ve ever seen them for sale. The bidders agreed, sending the final price to $8,125, against a pre-sale estimate of $1,000 – $1,500. That’s over $2,000 per knob. Not bad. There were very few French cameo glass lots in the sale, and they all did very well. 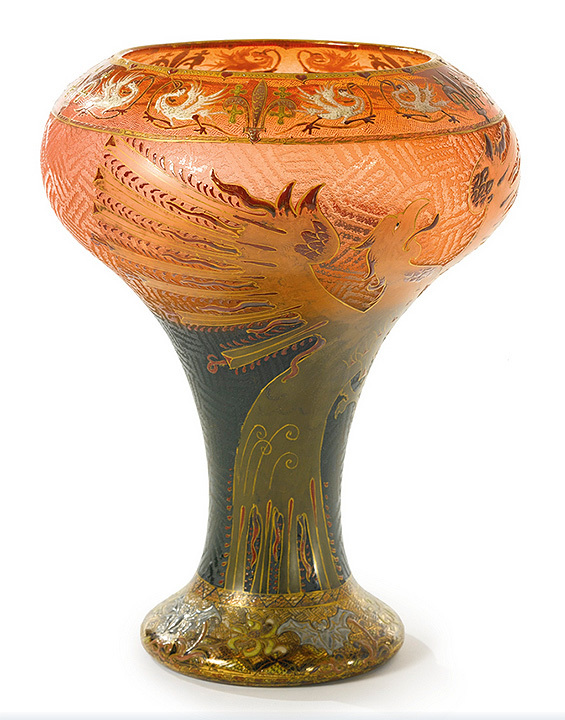 Lot #101 was a rare, large (12″) vase with a stylized dragon, in the German manner. Crossing the block with an estimate of $6,000 – $8,000, it soared to $28,125. It wasn’t for me, as it appeared that the dragon had been repainted at a later date. It’s time for a change of pace from the usual posts about shows and auctions. 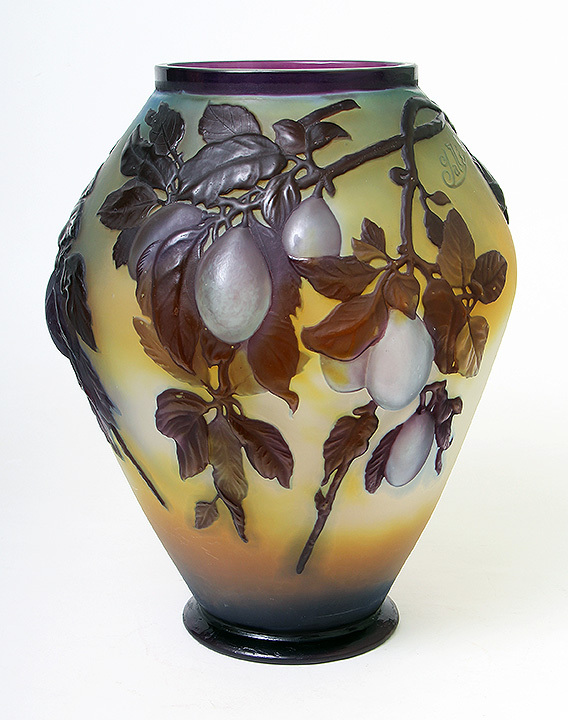 Today’s post is informational on the topic of mold-blowing of French cameo glass. Blowing out the flower or animal makes the decoration three-dimensional and therefore more realistic. 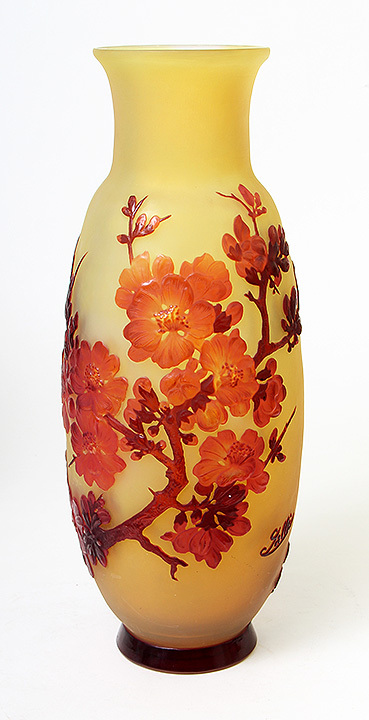 The technique raises the level of sophistication, making blownout vases much more desirable and valuable than those that are not mold-blown. 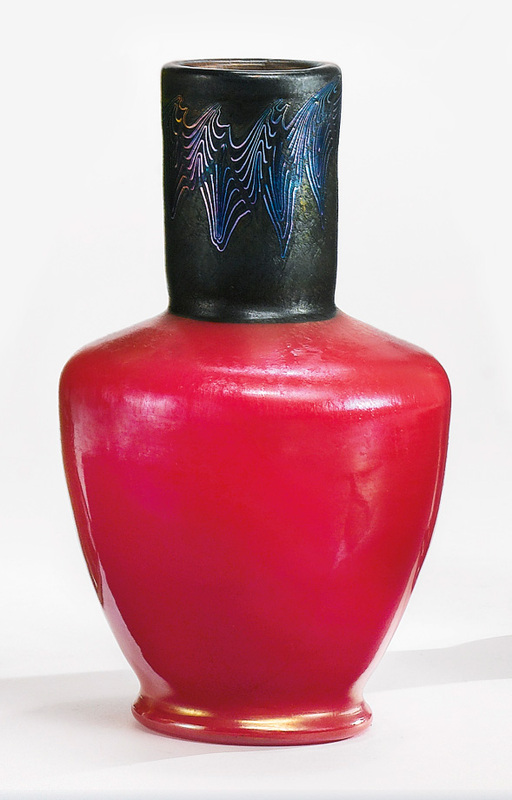 Mold-blown vases are sometimes called blownout vases or soufflé vases, all interchangeable terms. Gallé produced most of the known examples, while Daum produced a few. It’s possible other companies used the technique, but I’m not aware of any examples. My guess is that Gallé produced about 40-50 different models. The shape doesn’t change with different examples of the same model, but the colors can be quite variable. For instance, the clematis blownout vase may have blue flowers or red flowers (or other colors). 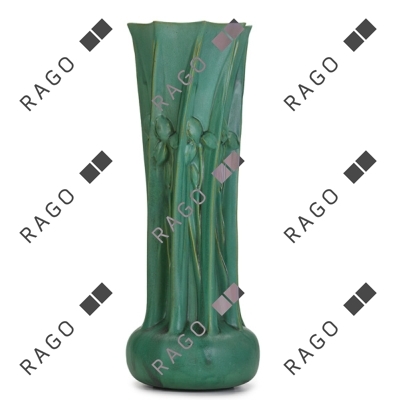 After the vase was formed in a mold, it was covered with different layers of colored glass, at the discretion of the glassblower. Then when it was cold, hydroflouric acid was used to etch the final design. 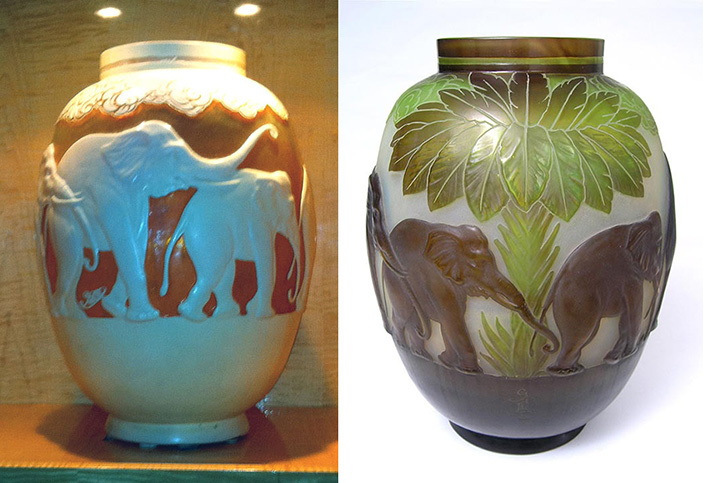 Elephant blownout vases are rare and valuable. They come in two different models — the brown elephant with trees and the white elephant without. 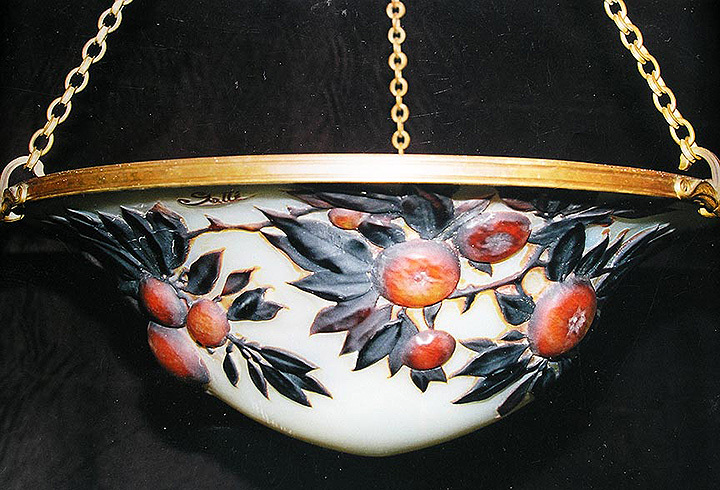 The rarest example I’ve ever seen wasn’t even a vase, but a chandelier with fruit decoration. I once saw one with a blownout squirrel, but I can’t remember if this was the same one. Probably not, as that one would have had acorns or something similar. It would be nice to find one of them today. 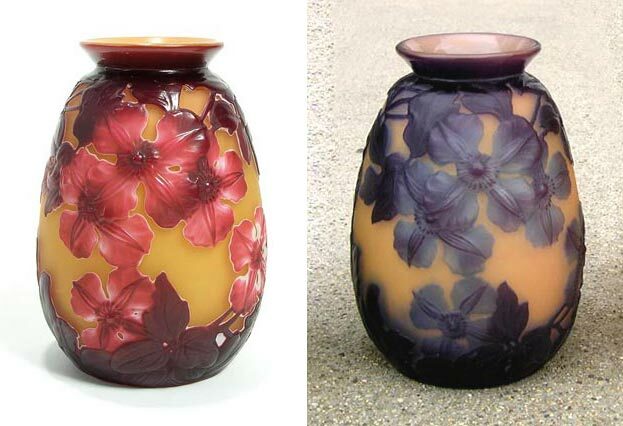 If you collect French Cameo Glass, consider adding blownout vases to your collection. Well-chosen examples will benefit every collection. I’ve got a couple for sale at the moment, with three great examples arriving this week. Check with me for specifics.